The Daily Beast and other outlets outed the social media personality as being the daughter of "Muslim-hating" pundit Pamela Geller, and uncovered years-old anti-Muslim tweets from the influencer. NEW YORK: Oath has canceled social media show The Morning Breath, hosted by Claudia Oshry, also known as the Girl With No Job, and her sister Jackie Oshry, after a Daily Beast story from Wednesday accused them of concealing their relationship with their mother, a controversial author and TV pundit. Oath has began an investigation, the Daily Beast reported on Wednesday. Representatives from the media company were not immediately available for comment. Claudia Oshry’s Twitter page, @GirlWithNoJob, was deleted and her website also redirected to another page on Thursday afternoon. Claudia Oshry has worked with brands including Casper, Subway, and Amazon. Casper's comms director, Emma Frane, said via email that the brand does not work regularly with Claudia Oshry. "We worked with this account on one Instagram post back in June — and we asked that she use the proper #ad disclosure — but nothing beyond that post," said Frane. When asked whether Amazon is working with Claudia Oshry, Craig Berman, VP of global communications, said, "I have no idea who this is, or how we may or may not have been working with her. I don’t even know who on the team to send you to." Representatives from Subway could not be immediately reached for comment. 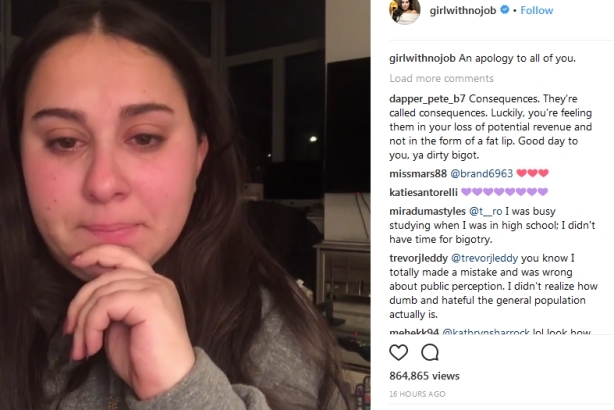 The Daily Beast story contended that Claudia Oshry and her social-media-famous sisters Jackie, Olivia, and Margo have tried to hide their relationship with Geller, who has "built a career off leveraging the media to incite outrage with her racist, Islamophobic comments." On Tuesday, the story’s author, Taylor Lorenz, tweeted screenshots of since-deleted tweets from the sisters, which included jokes about Muslims. On Wednesday evening, Claudia Oshry posted a video on Instagram addressing the matter and apologizing. "We want to be clear to our audience and fans that our political and cultural beliefs are not anti-Muslim or anti-anyone. Our views are separate from our mother’s. Being raised by a single parent, we were taught to make our own choices based on our personal beliefs. We are inspired to think for ourselves and we do. We do not condone discrimination or racist beliefs of any kind." BuzzFeed reporter Julia Reinstein tweeted on Thursday afternoon that CAA confirmed to her that Claudia Oshry is no longer a client. She signed with CAA late last year.